I'm loving all the ways to use my cast iron. Tonight, we did an experiment...we cooked our pizza on the stove top in the skillet. It was an amazing success and it didn't really heat up the house the way cooking a pizza in the oven would. The added bonus now is knowing we can make homemade pizza on our camping trips! 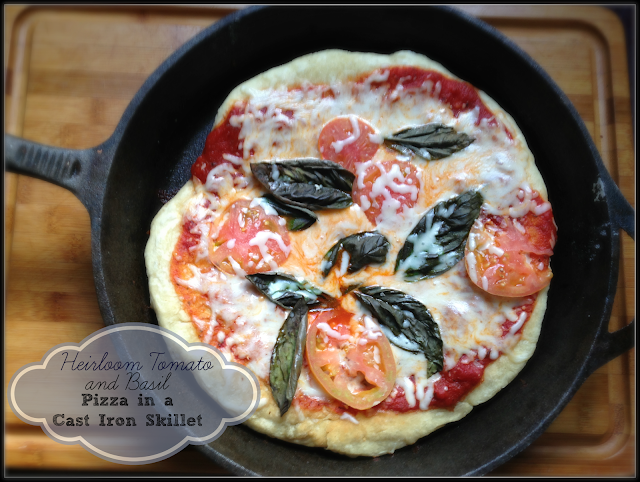 Cooking the pizza in the skillet is super easy. 1. Add about 1T oil into a cool skillet and heat on medium heat. 2. Roll out your dough on large flat surface and gently transfer to the hot skillet. 3. Cook for about one minute, then flip it over. 4. Add your toppings. For ours, we used Thessalonian Greek heirloom tomatoes and fresh basil, plus shredded mozzarella cheese. 5. Cover the skillet to allow the cheese to melt and everything to heat through. The entire process should take about 5 minutes! That's right... homemade pizza in 5 minutes. Pretty amazing, huh? I'm thinking pizza won't be just for Friday nights. My kids love cold pizza, so we may even see some pizza leftovers in the lunch box. The crust was thick and chewy. Really just so much better than any pizza delivery place could ever offer. For our crust, we use this basic dough recipe. Miki, Great discovery! Boy, that looks good and so much better for you than delivery or boxed pizza. Tell Robin to look for old iron skillets at flea markets and thrift shops. I have found a couple that way.